Katmai National Park and Preserve is a natural park and wild reserve of the United States located in the south of Alaska, known as the Valley of Ten Thousand Smokes. Together, the park and reserve cover an area of 4,093,053 acres roughly the size of Wales. The majority of this is an area dedicated to nature and wildlife where hunting is strictly prohibited. The park was named by the stratovolcano of Mount Katmai. First, the area was designated as a national monument in 1918 to protect the area created by the great volcanic eruption of 1912 of Novarupta, which formed the Valley with a pyroclastic flow of about 24,710 acres. The park has 18 individual volcanoes, seven of these volcanoes, since 1900 are still active. In 1912, the Novarupta erupted – one of the largest volcanic eruptions in historical times – forming the Valley of Ten Thousand Smokes. To protect this area, it was declared a National Monument on September 24, 1918. The national monument was extended three times by presidential proclamation: on April 8, 1942, by Theodore Roosevelt; January 20, 1969, by Lyndon B. Johnson (94,394 acres); and, finally, on December 1, 1978, by Jimmy Carter (1,369,952 acres). After these series of border expansion, the current park and preserve were established in 1980 under the Alaska National Interest Lands Conservation Act. Finally, by the Congress of the United States. After its designation, the monument was very underdeveloped and not visited by tourists until the 1950s. Initially designated due to its violent volcanic activity, the monument and its surroundings are now appreciated for their abundance of red salmon, brown bears, which feed on these, and a wide variety of Alaskan wildlife. Katmai is located on the Pacific Ocean side of the Alaska Peninsula, off Kodiak Island in the Shelikof Strait. The main features of the park are its coast, the Aleutian mountain range which has a chain of fifteen volcanoes that crosses the southeast region of the park and a series of large lakes in the western part of the park. The most significant town closest to the park is King Salmon, where the central offices are located. The Alaska Peninsula Highway connects Lake Naknek, which is near the entrance to the park, to King Salmon continuing to the mouth of the river at Naknek. The road is not connected to the Alaska highway system. Access to the interior of the park is by boat through Lake Naknek. There is another road that goes from Brooks Camp to Three Forks, which has a view of the Valley of Ten Thousand Smokes. The 497 miles coastline runs from the entrance to Cook Cove in Kamishak Bay to the south of Cape Kubugakali. The mountains go from the southwest to the northeast, about 15 miles inland. Katmai is also well known for the brown bear populations and the sockeye salmon. Katmai has the largest population of protected bears in the world, estimated at about 2200 bears. Bears usually congregate at Brooks Falls when salmon are spawning and many well-known photographers flock to the visitor’s platform to take photographs. Compared to other rivers, salmon arrive early at Brooks Falls. 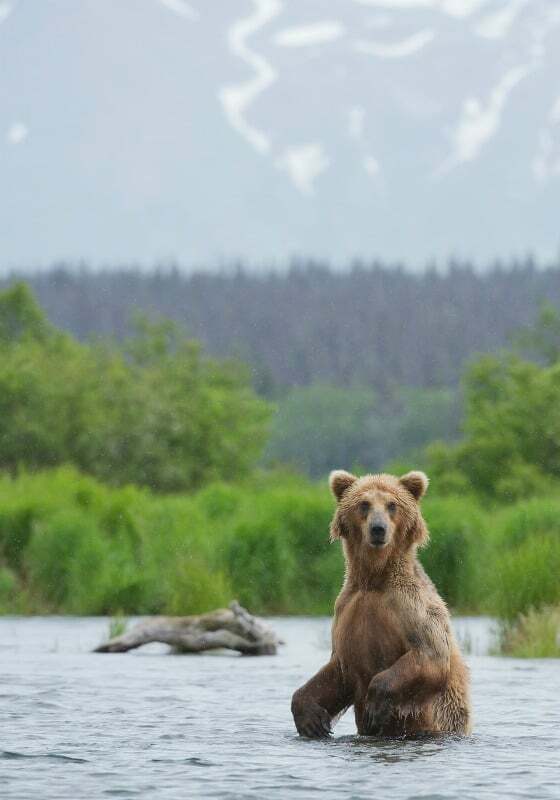 Between 43 and 70 bears have been documented in the waterfalls in July and the same amount of bears are seen in the lower part of the river in September. Coastal areas, such as the Hallo, Kukak, Kuliak, Kaflia, Geographic Harbor and Chiniak bays, also harbor high densities of bears throughout the year, due to the availability of edible clams and Sedges, as well as salmon and other fish. The park is home to 29 mammal species, 137 bird species and 24 kinds of freshwater fish. It is mainly known for its brown bears, the park with the largest population in the world. Brown bears gather in large numbers in Brooks Falls to catch migratory salmon. Fed by this rich supply of protein, Katmai’s brown bears can grow to large sizes: large males exceed 10 feet and weigh up to one tonne. Many other species that live in the park are elk, wolf, lynx, wolverine, coyote, otter, red fox, porcupine, and marten. The oil spill of the Exxon Valdez company in Prince William Sound on March 24, 1989, produced extensive contamination along the coast of Katmai. By the beginning of April, oil had reached the Kenai Fjords National Park. The spilled oil reached Cape Douglas in Katmai on April 26 and places south in the next week. In early May, a variety of oil-removing ships were working in the Shelikof Strait, however, 90% of the Katmai coast was contaminated. The most affected areas were Cape Cjiniak, Chiniak Lagoon, Hallo Bay Beach and its lagoon, Cape Gull, Kaflia Bay, and Cape Douglas. It is estimated that approximately 8400 birds died due to the spill.